Under both the recent Mayor Daley and now Mayor Rahm Emanuel, Chicago has seen its public investments and focus shift more and more to expanding public transit options throughout the city. From expanded water taxi service along the Chicago River, to improved mobile apps and computer displays that provide customers accurate information on arrival times, the city has done an admirable job recently in improving the lives of people getting around. Two of the most recent expansions in public transit, however, provide both praise-worthy and cautionary tales about rolling about public-private innovations and the dangers of city overreach and mismanagement in doing so. The recently unveiled Divvy Bike bike-sharing program (following successful forebears in New York City and San Francisco, among others) has been by all accounts a runaway success. Managed by AltaShare, which was awarded a lucrative contract by the city in return for proceeds from bike rentals, the ubiquitous blue bikes with their constantly flashing headlamps can be seen dotting the city from the Loop to Logan Square. The rental stations, which are solar-powered and usually placed on corners in busy neighborhoods and quiet neighborhoods alike, are especially friendly toward yearly members. An annual membership runs only $75, offering a member a specialized key that lets them skip the glitch-heavy station touchscreens and use bikes liberally. The service is also paired with Divvy Bike Locator, an iOS and Android-friendly app that updates riders on station locations, as well as the availability of empty slots or bikes at those locations. But the city can’t afford to brush its shoulders off too much from the success of Divvy. More recently, the city has begun a slow roll-out to Ventra, a new fare-card system intended to make the passenger experience easier by allowing customers to use their credit cards or smart phones to load the card on the go, previously a significant hassle for Chicago commuters. However, the card, which is meant to offer passengers a single fare-card for the three major Chicago transportation services (CTA, Metra, and Pace) also has come loaded with controversy. The card requires a one-time fee (admittedly applied to future fares) and also has been paired with fee hikes on the existing fare card system, which the city hopes to phase out. Early stages of roll-out have been problematic to say the least; hundreds of early Ventra cards issued to public school and college students in the city have been void of balances or simply not working. This has led to a fairly large-sized outcry against the system, bringing questions into the city’s management of the roll-out as well as the partnership it negotiated with Ventra itself. Further integration of responsive and customer-friendly technology (Divvy app, solar-powered touchscreens at stations) will only continue to develop in response to customer demand. Private management allows for creation of private sector jobs, as well as a focus on efficiency that removes the many city regulations and levels of bureaucracy, especially present in Chicago. Membership-inclined financial model looks to provide a steady source of growing alternative city revenue, especially important given the city’s badly mismanaged finances. City regulations, mismanagement, and liability issues remain ever-present problems and limitations to potential revenue from either partnership. Lack of responsiveness to passenger demands and interests (slow improvements to station glitches with Divvy, general disinterest in fare system changes for Ventra). Potentially glitch contracts. The city has been characteristically vague about its own expectations for revenue and cost from these services. The market for alternative transit options in Chicago is especially high, engendered by the well-designed public transit systems already in place. Biking is especially popular in the city. 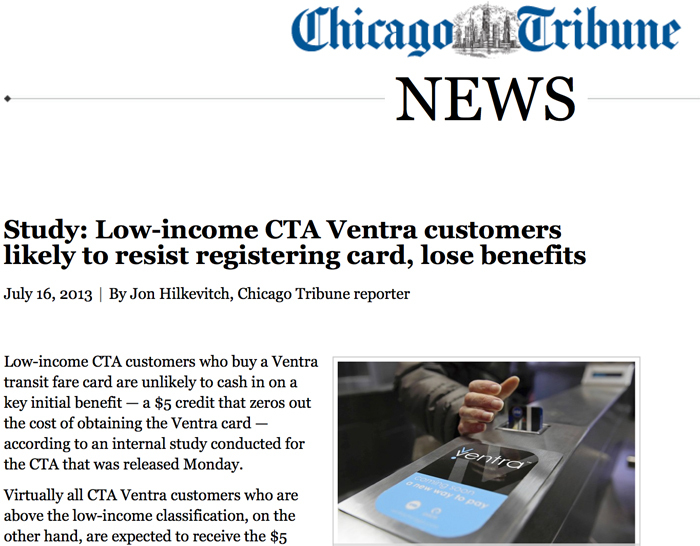 If Ventra can remove the system glitches and unnecessary fees early enough, the system still has the potential to be a significant improvement over the existing one. 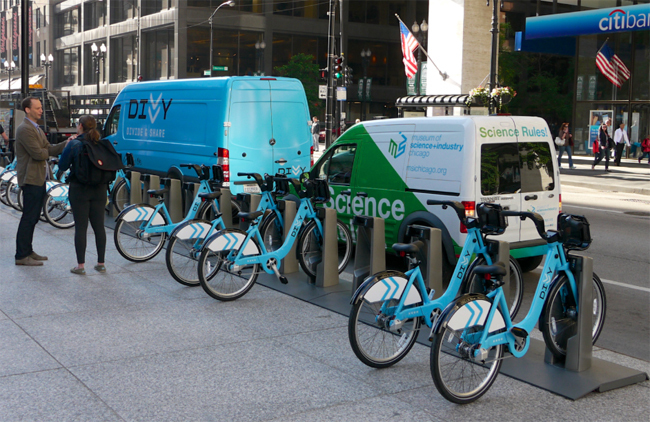 The city has shown a willingness to leave hands off with Divvy during its recent success, raising hopes that it will learn to do the same with Ventra. Chicago. Perhaps the most colorful history of corruption and mismanagement of any major American city. Current administration still features layers of excessive bureaucracy. The weather for Divvy. While the program has been wildly successful this summer, Chicago’s climate is notably bike-unfriendly from November through April. A definite market limit. Private competition. While there were already existing bike-rental services in Chicago, the city may be undercut by a better-operated private alternative. The two transit initiatives share one distinct feature; they show a definite focus from the city on improving commuter and passenger experiences for the future. That said, the city’s continued mismanagement and ineffective communication and public relations work have left Ventra as a significant black eye on the city before the program has even been completely introduced. The counter is Divvy, being improved daily by its private management at AltaShare and continuing to grow as a visible presence on city streets and paths. The lesson for entrepreneurs is one that probably comes as common sense to many. When entering into investments or partnerships with public entities, do your best to position yourself separately from the partner. AltaShare, which negotiated a contract that ensured the city would reap benefits enough to remain in the back seat, has demonstrated effectively the importance of keeping this distance. The city’s big plans for Ventra were met by interest by many who are currently frustrated in trying to integrate these different transit systems, but the city’s inability to properly introduce the system and educate commuters on it has been a constant issue. The contrast between the two seems like a fairly straightforward lesson, at least until winter gets here and we see how many souls brave the Chicago winter on a Divvy bike.